The Rickie Miyake Blog: When I Grow Up.. Being part of the Amazon Vine program is nice - each month I get to select two items from a list of product samples to try, absolutely free. A week after the first offering in the month, all of the unclaimed samples are offered and I can choose two more from those, if I want. June's selections included the book on the right. I didn't pick it, though, because there were a couple of other choices I found more appealing (i.e., more expensive, haha). Yet, this book intrigued me after I read the product description. I thought I would wait to see if it was one of the "leftovers" the following week, at which time I would pick it. But it kept nagging at me, and this, along with a fear that maybe all the samples would be gone by then, made me order the book and actually pay for it. It's one of those self-help type books that are meant to motivate and guide the reader to discover his or her true calling in life, and then to carve out a path to get there. The hook, or angle of this book is it is written in the negative, i.e., the author tells you how not to succeed by not following the advice in the book. I admit I have read several of these types of books. I even ordered the second one like this that was offered as a Vine selection, this one co-authored by the guy who played Pedro in Napoleon Dynamite. Really, these books might have different writing styles or angles, but they all say pretty much the same thing. All you have to do is follow one of them; you don't need to buy several. I guess that's been my problem - I read but don't follow through. I don't think I am alone, though, because otherwise the authors of these types of books wouldn't sell so many of them. It's not that I am unhappy in my present job, because I'm not. But given my druthers, it wouldn't be my first choice if I could do anything at all. 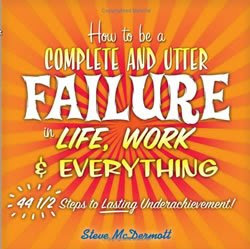 The author, Steve McDermott, asks the reader what he or she would do if they knew they couldn't fail. What would they really, really like to do? I had my answer right away. Two things: The first you would have guessed from reading my earlier posts about how much fun my garage band days with Easy Livin' were; and the second? I would love to write for a living. Yup, no hesitation, those are the two top (and really only) items on my list. So what's keeping me from these dreams? As far as I can tell, just me. You know, it's time I got out of my way, don't you think? There but for me go I.